Our homeschooling family reads books aloud during lunch each day. Those who have a hard time sitting still, don't struggle, because they're eating their lunch at the same time. We have also found that reading during meals cuts down on arguments and negative behaviors while at the table. Jason and I hand pick our family read aloud selections to best fit the interests and abilities of our children. We also enjoy throwing in some of our favorite books from the past. It's always fun trying to balance books that both the boys and the girls will enjoy. In years past, we've attempted two books per month. This year, because the books are so much thicker, we'll focus on one, and then if we have extra time, possibly slip in another book of choice. 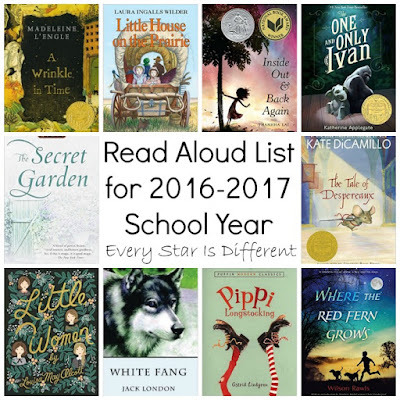 Here is our read aloud list for the 2016-2017 school year! We kick of the year with this book as an introduction to great characters, especially female protagonists. The humor will be an added delight. The boys are at that age, where all they want is a dog. What better way to capture the moment than to read this beloved classic. It is also a great way to help the kiddos work on identifying emotions during difficult circumstances and work through them. A tesseract and space will capture the boys' attention in seconds. The story about not quite fitting in, is for everyone in the house. We hope reading this book will be a magical experience. Reading and/or watching the play or movie of Little Women is a tradition that I have faithfully celebrated at Christmas time every year since I was in college. This year, it is time to introduce the tradition to my children. As a child, I loved the story of White Fang. It's my hope that the kiddos will enjoy it as well. The book seems like the perfect winter read. The kiddos are very aware of the refugee crisis going on in the world today. This month we have prepared a home for a refugee family from Iraq, and greeted them at the airport as they arrived in the United States of America. This book seemed all too fitting as our family continues to help them adjust to life in America, after all they've left behind. Our boys have a special love for animals. This story is for them, to encourage a new perspective and to provoke thought. It's my hope that the girls will enjoy it also. This will be our third read aloud book from the Little House on the Prairie series. We have thoroughly enjoyed the first two. Why stop now? A mouse, a princess, a castle, and dungeon... There is something for everyone in this book. We hope the read aloud experience is an enchanting one. This book was selected because it's another one of my favorite stories from childhood, but also because it was recommended as a book for Princess, by her therapists, to aid in her therapeutic process. If that wasn't enough, the kiddos will be introduced to the musical this year as part of our music studies. We are very excited to start our read aloud list this year. Reading at lunch time has become such a ritual in our home that the kiddos look forward to every day. 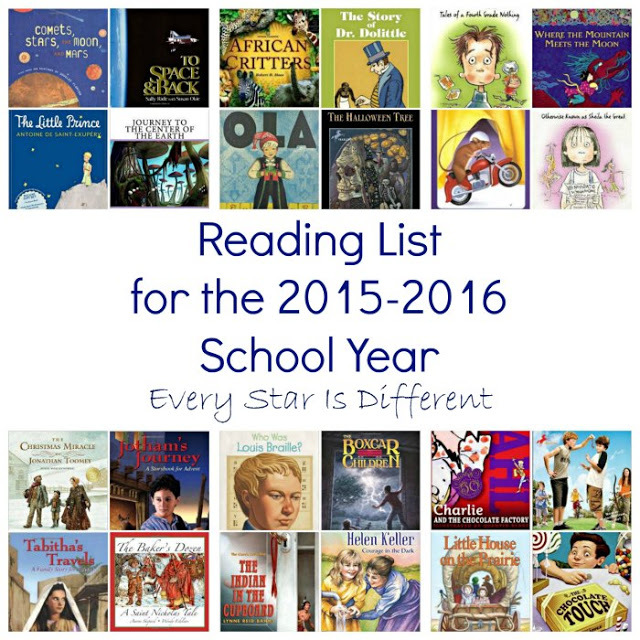 If you're interested in last year's reading list, be sure to check the post below. What books are you reading with your kiddos this year? Que selección tan interesante, no los conozco todos, pero los que conozco me encantan. Otros como la casa de la pradera no sabía que estaba en libro. Me encantaría saber como lo hacéis? leéis vosotros mientras los niños comen y vosotros coméis a otra hora? Es que comer y leer a la vez...me ha parecido muy interesante pero no acabo de ver como hacerlo.